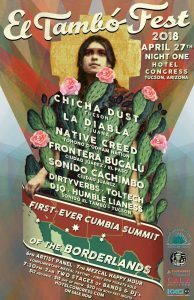 SFA is proud to support El Tambó in presenting the first-ever Cumbia Summit of the Borderlands on April 27 and May 4, with live music, educational panels, and plenty of dancing. Don’t miss it! Price: $12 advance, $15 day of show, $20 package for both nights of El Tambó Fest. More info and tickets are here. 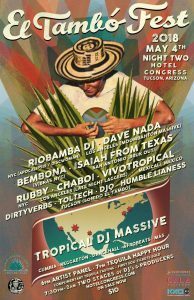 Producers of some of the best parties in the nation converge in Tucson to celebrate a national movement of young, latinx-centered cultural platforms celebrating diaspora and global dance rhythms including cumbia, reggaetón, dancehall, afrobeats, moombahton and more. 11 acts spread across two stages for a night not to be missed. Price: $10. More info and tickets are here.